Thank you for joining me as we count down to the MFT release. We are four days away from the big day! All the new Stamps, Die-namics, and Stencils will be available on Tuesday, September 6 at 10:00 pm EST. Be sure to check out the MFT Blog to see all the new items being revealed today. Don't forget to leave a comment on the MFT Blog countdown posts, YOU could win one of the five $75.00 gift vouchers. We are releasing so many AMAZING products this month! 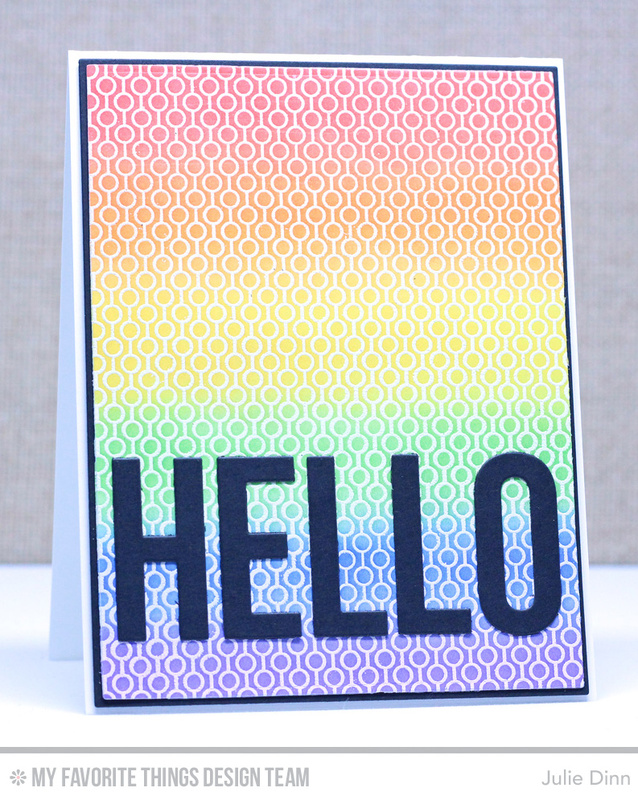 For my card today I am sharing two of them with you, the Lined Up Dots Background and the Big Hello Die-namics. I LOVE both of these! I stamped a piece of Smooth White card stock with the Lined Up Dots Background and Versamark Ink, I embossed the image with White Embossing Powder. I grabbed a few of my favourite bright hybrid inks and the Clarity Stencil Brushes to create the rainbow background. The sentiment was created with the Big Hello Die-namics. I added a piece of Double Sided Adhesive to my card stock before I cut the sentiment. This makes it easier to adhere to the card. Oh WOW!! I LOVE that background stamp!!! Such a lovely card! Very bold and striking! Loving the new background stamps! Such a great idea! I love the color gradation! And thanks so much for the tip of adhering the double-sided adhesive for cutting out the HELLO! Great looking card! Beautiful card that really sends the thank you message- great use of the background stamp.